Who will call the shots in the future? How do we imagine the future? Where are the borders between the digital and analogue world? Will machines soon dominate human beings? And – what is it actually that makes us human? 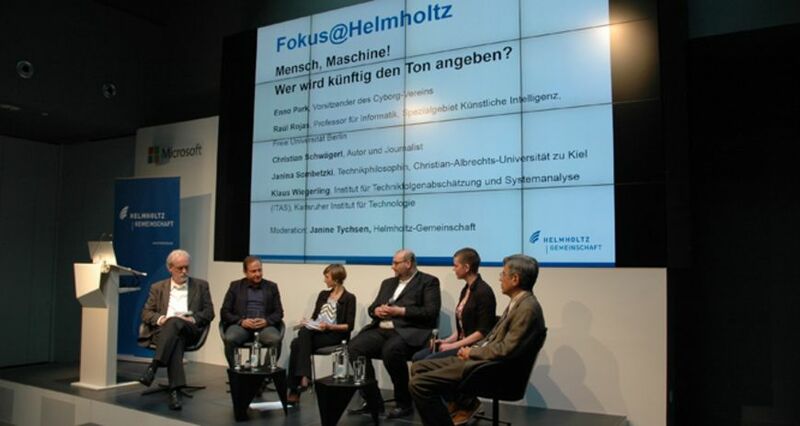 In Berlin, scientists and philosophers had a discussion in the panel series "Fokus@Helmholtz". Christian Schwägerl, Journalist and author of the book “The Analogue Revolution” introduced the audience to the complex topic “Man-Machine” in his keynote address. He showed robots in short video clips that were always falling down in their attempts to imitate human activities, for example, by trying to open a door. This proved to be a good starting point for the discussion which made the approximately 100 participants laugh. It was clearly shown here that man is superior to machine. Is this an all-clear signal? Far from it! Human beings are creating an entirely technological and digitalised world. Technology is no longer penetrating only individual aspects of our lives such as the energy sector or mobility; rather, it is penetrating all areas of life. Technology for everybody – linked everywhere all the time! In short, co-evolution between human beings and machines is now emerging. Previously assumed barriers between man, nature and technology are gradually disappearing. Or were they never there in the first place? Man is expanding his capabilities through technological advances, technical devices and digital developments. We live in digital ecosystems created by Apple, Google, Amazon, etc consisting of mobile telephones, tablet computers, laptops, computer programmes, e-books, music files, films as well as operating systems. Can we also attain the goal of digital humanism, about which the recipient of the Friedenspreis des Deutschen Buchhandels, Jaron Lanier, has been speaking? What Lanier understands as digital humanism is both the protection of intellectual property as well as the rights of every individual to his data in the internet. Or will the digital future be totalitarian and repressive? Is the web economy accelerating destruction of the environment, or is technology becoming an intermediary between man and nature? Through Web 2.0, the internet of things, and industry 4.0, we are increasingly enabling machines to communicate with one another. But is there now a threat that technology would one day do quite well without us and no longer need us? Machines can do many things better than humans – play chess for example. It could well be that we consider this to be an affront, and that our suspicions vis-à-vis the power of machines are justified, as Janina Sombetzki has conjectured. The list of affronts to man’s self-image is long. With Copernicus and his discoveries, the earth lost its status as the central star, and Darwin took away man’s notion that he is the pride of creation. Where has our superiority gone? And if this soon ceases to exist due to the rapid pace of technological advances, what is it that still separates us from machines? Raúl Rojas proposed the Turing Test as a distinguishing feature. In this test procedure, a man and a machine “communicate” via keyboard and monitor with neither visual nor audio contact. A third party poses questions that appear on both monitors. Both – the human being and the machine – answer these questions independent of one another. They try to convince their counterpart that they are a thinking human being. After the comprehensive series of questions, if the questioner is not able to declare which of the two is the machine, the machine has passed the Turing Test. It is then surmised that the machine maintains intellectual powers on a par with the human. Yet the highest level of distinguishing criterion in artificial intelligence is, for philosopher of technology Janina Sombetzki, the lie – even higher than the capacities of imitation and comprehension. A computer system does not choose a lie, it calculates a decision. It does not creatively and quickly construct a “new truth” – in the process it would entrap itself and fail. The potentialities for autonomous driving vehicles are already in place. Raúl Rojas has been conducting research with his team in this field for many years and has developed the “Spirit of Berlin” – an autonomous test vehicle that has been on the road in the capital city for several years. The issues related to liability, responsibility and morality are considerably more complicated. Janina Sombetzki introduced a moral dilemma into the circle: How should a vehicle decide who to avoid in an inevitable accident situation: should it avoid an older person or a child? Who is going to assume responsibility? Are these probabilistic calculations, algorithms or moral-free decision-making structures? Will the answer depend on the world-view and human image of the programmer and/or enterprise? Schwägerl approaches this concept less seriously; after all, motoring is becoming safer – in light of the fact that there are one million traffic fatalities per year worldwide – due to machine deployment. When all is said and done, the issue really comes down to how much autonomy we humans are willing to grant to robots and machines. Philosopher of technology Janina Sombetzki answers: “As much autonomy as is required in the respective area of application.” For example, a domestic robot in the field of geriatric care would have a different range of responsibilities and, hence, a higher degree of autonomy than a domestic robot in gastronomy. For hybrid man-machine systems as represented by drones, new concepts of responsibility are necessary. Isn’t it possible to programme in, if not morality, then at least values as a framework for negotiation concepts? What would new hybrid responsibility, system responsibility or network responsibility look like? Generally speaking, to what degree do man and machine already overlap today? Enno Park, a self-proclaimed cyborg now that he wears a cochlea implant (hearing prostheses), says that man already is, innately, a cyborg. The development is actually quite well known: first, man used a hammer, then a pair of glasses and today implants in order to improve his skills and compensate for his deficits. Take the Paralympic Games for example. Endoprosthetics and also telemedicine, for example, show potential: artificial knee joints that can be reprogrammed, or telemedical monitoring of patients with chronic heart problems. Enno Park says there is major ambivalence between possibilities and risks. After a complicated operation, his implant gave him back the faculty of hearing. But he doesn’t want the “Googles” of this world to have the capacity to read the data in his implants. Who do my data belong to anyway? This led to issues of power in the form of means, design, programming, access, recycling and their respective consequences. Who will design the development? Christian Schwägerl commented that Google is also conducting research on artificial intelligence and they are spending a total of about nine billion dollars annually – as much as the German government invests overall in the research activities of the four big research associations. Who is advancing developments? Will new enterprise monopolies arise that could become unassailable and socially disconnected? The new models are services offered by enterprises: a new mobile phone, a shopping tour through the internet, or cashless payment against data in the hand of an enterprise. Many people are excited about using the mostly free-of-charge offerings, since they make life easier. The merger of the virtual with the digital world is forging ahead, unstoppable, in the context of this dynamic. What about the “old” concepts of free access, open data and a network that is free of hierarchies? Klaus Wiegerling escalated the discussion. Hopes and fears have arisen for a good reason. Leaps in innovation triggered huge expectations; encountering them with equanimity is probably not a bad idea. After all, we have to deal with this ambivalence, says Wiegerling. The crucial issue at the moment seems to be: What regulations do we need to govern technological development and technological application? After this 90-minute excursion into the virtual and real worlds, an all-clear signal was given after all: after 40 years of research into artificial intelligence, Raúl Rojas is convinced that robots will not seize power – at least not in this century.